* How to store your potato. The long-awaited day for harvesting potatoes comes - you feel well-satisfied and your family and friends are proud of you. And not least because the first 'new' potatoes are much sought after and more expensive to buy. Now you'll rest a little easier knowing you have good food in store. Because your fresh potatoes will be many times healthier than processed potatoes. How was your potato harvest? 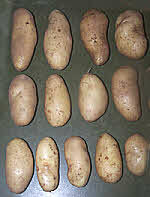 Upload your pictures & share your success or problems in growing organic potatoes with this link. Learn more with the-organic-gardener.com. But when are your potatoes ready? Can you harvest potatoes without spiking or slicing? Tips on storing your potato crop. Be patient... With green healthy leaves on top, you can be sure that potatoes are growing underneath. When your plant flowers (some varieties don't) that's when the tubers really start to swell up and that's when you'll want to start feeding with liquid manure and liquid comfrey. Although warm soils may help, too much warmth can cause embryo tubers to revert into leaves. Maintain adequate soil moisture and mulch well. 'New' means picked fresh but not stored. They are well-grown in raised beds. 'Early' potatoes take from 60 to 90 days to crop and 'second earlies' 90 to 120 days to crop. But don't forget that 'new' potatoes can be taken from 'earlies' or 'maincrop'. A few small 'new' potatoes may be ready shortly after your potato plant flowers. 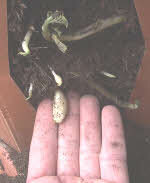 They are about the size of a hen's egg - draw back the soil to see them, then replace. These 'new' potatoes are crisp fresh spuds and delicious to eat. And more potatoes may grow to replace them. You can find them most easily by lifting up the sheeting or mulch on a raised bed. A few nice and clean potatoes will be resting on the soil surface. Take about 2 per plant when needed. 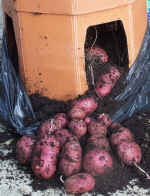 Find more about growing potatoes in raised beds and potato bins. With potato bags, tubs and pots carefully excavate the compost surface away to find them growing beneath. This potato barrel >> also has side doors that give you direct access to the new spuds inside. Some patio planters are made like wrap around rolls that unfasten down the side to give you access and make harvesting potatoes easy. Don't be dissappointed if at first you don't find much. More potatoes and bigger ones should appear a little later. End of season harvesting is described below. If you've grown your potatoes in ridges or hills you can carefully scrape away the soil to find those tubers worth harvesting. These will be fresh 'new' potatoes. They'll poke up through the ridge so keep them well covered to prevent them greening up. Lawn trimmings reduce Scab and make ideal mulch. A soil scoop is useful for uncovering and lifting 'new' potatoes. When you continue to pick 'new' potatoes a few at a time there's a good chance that smaller 'embryo' potatoes will take up the lead and grow bigger. All those tiny spuds that you pick out end of season could grow up to proper size. More below on harvesting potatoes end of season from bags, tubs and barrels, and Christmas potatoes. Your maincrop potatoes should be ready in about 120 to 140 days. The potato flowering time usually indicates that they are swelling up. Whether or not you've already sampled some of your maincrop, by the end of season the bulk of your maincrop needs to be lifted from garden soil into store. First cut down the potato haulms (stalks) and remove to your compost heap. If blighted you may choose to burn them. Blight spores were not able to survive U.K. winter cold until a new mutant strain was introduced by mistake. Now leave the potatoes in the ground for 10 to 14 days. This is to prevent blight spores from contaminating the tubers and causing your potatoes to rot in storage - it's also a good reason for ridging up the rows or growing under sheet mulch so as to protect the tubers. 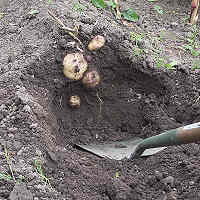 Most gardeners advise digging up potato rows from the side of the row using a flat tined fork. Short handled forks are the easiest - for the U.K. check this potato fork. You move the plant into the trench. Grasp the remaining neck of stalk to help lift the plant whole. But I usually work differently. Starting from the end of the row I dig down and move the soil behind me taking the tubers out as I go. The exposed soil ridge looks like a quarry face. It's probably not the easiest way to do it - but I love gardening. You should remove all tubers from the garden soil even tiny ones, otherwise they will attract pests or grow again next year. Handle potatoes with care to avoid bruising them. When harvesting potatoes from tubs I tip it upside down into a large polythene bag. Then I scrape the soil back into the empty container while picking out the tubers. Note that potato barrels and wrap arounds are more accessible. 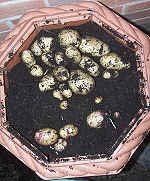 With late season Christmas potatoes you could leave them outside in their spud tub or bag and simply cover it over. Then you won't be able to pick and sort them but the larger ones will probably be at the bottom. Leave your spuds outside on a riddle to dry in the sun for a few hours. I turn mine over half way through. I class the tubers into different sizes as well as clean / healthy and damaged or infected. Diseased or damaged potatoes won't keep. Look out for white furry growths and dark bruise like areas. Cut a few open to check inside. They say 'early' potatoes don't store as well as your maincrop. However, I've stored 'second early' varieties beyond Christmas in good condition. I've now found that tuber size makes little difference - but good keeping varieties are preferred. Next I laid them out in my living room covered by sacking to keep them in darkness. (Would you believe they were there for a few weeks?) The warmer conditions may be important to cure the potatoes for storage. Then I remove the crop to hessian or burlap sacks to store in a dark cool ventilated garage. Brown paper sacks are not well-ventilated. Mine have kept well. I also have a smaller bag that excludes the light. It has a handy velcro fastened lid and handles to lift. This spud bag serves me to have a select number in the kitchen ready for use. Check the spuds regularly. Any wiff of ammonia or putrid smell indicates rot. Don't ignore it. Root down until you get the offending tubers out. Any that have been contaminated with dripping ooze can be washed and used immediately. One last thing - storing potatoes in the fridge is not recommended as it causes the starch to turn into sugars. That means if you use them for chips you get a brown color when the sugar caramalises - that might be nice. Potato Scrubbing Gloves - Here's a new idea! - my Mum would love these. Potato sacks on these links are essential for good disease free storage. Vegatable sacks are available here in packs of 10. Potato barrels, Giant Potato Tubs, Wrap Around Patio Planters and Airpots are available from here - and you'll be harvesting potatoes on the patio. Raised bed kits are here. You'll find proper sized specialised potato forks here. And you may like the Wheel Easy to help you gather and transport the potato harvest. And for harvesting potatoes and other crops you'll find garden mats and kneelers on this link to keep your limbs warm, dry and active. And for vegetable harvesting you'll also find garden mats and kneelers on this link to keep you warm, dry and active. 16th September 2011: Later than usual for harvesting potatoes, my second early crop of 'Juliet' is just in. Below I list the tubers by increasing size order. 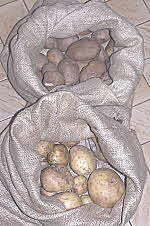 10 seed potatoes produced 100 tubers totalling about 7 kilograms (over 15 pounds). 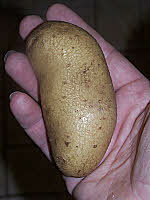 Average tuber weight a respectable 70grams (2.5 ounces). Each potato plant produced 10 tubers and 700 grms of potato. Grown in a raised bed (easy for harvesting potatoes) they're all high quality tubers (pictured) virtually scab free - believe me you wouldn't notice it. Note: the small sized residual makes the grand total even larger. How was your potato harvest? Upload your pictures & share your success or failure in growing organic potatoes. Click here to write your article and share your news of potato growing with other gardeners. Do Share Your Gardening Experiences - are you growing organic potatoes? Write about your potato crop on the form below. Visitors to the-organic-gardener.com will see your photos, and read about your potato garden, a good crop or a bad crop. Compare your crop yield with other organic gardeners. On behalf of all the gardeners reading the-organic-gardener.com, may I take this opportunity to thank you for sharing. Please enter your article title here. Note the-organic-gardener.com usually displays pictures between 150 to 200 pixels wide but may display larger pictures. The maximum image size accepted is 800 x 600 pixels. So you may have to resize a your pictures before uploading. Use Picnik free to edit your pictures online - Home tab to upload a picture, Edit tab to crop, resize etc... and Save tab to download your picture with a new name. Click here -- to submit your information about potatoes. Click below to read previous contributions on Growing Potatoes.